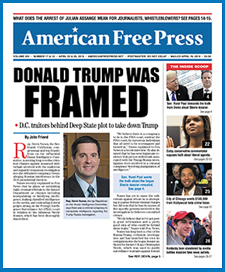 Media claims that the migrant caravan now at Tijuana is peaceful are lies, as explained in the front-page article ofAmerican Free Press Issue 49 & 50, now in the mail to print subscribers and available to read online. Login here. On Nov. 25, tear gas and pepper spray were used by U.S. Border Patrol agents to repel hundreds of migrants hell-bent on gaining political asylum in the U.S. following a rush on the U.S. border, which resulted in a temporary shutdown and major delays in crossing the port of entry. Dramatic video captured near the San Ysidro Port of Entry bordering Tijuana, Mexico shows countless migrants attempting to force their way into the U.S. as many tried to run past security fences, evade immigration officials, and otherwise illegally enter the U.S. Some were seen throwing rocks and other projectiles at border patrol officials, as Mexican law enforcement officers struggled to contain and manage the mob. Thousands of migrants, largely from Central American countries, have made their way north through Mexico in a caravan in recent weeks while many more continue their journey, raising concerns with both the Mexican government and the Trump administration. President Donald Trump has characterized those participating in the caravan as economic migrants opportunistically fleeing their home countries with the hopes of taking advantage of America’s generous asylum and social welfare policies. Many of the migrants are criminals with ties to gangs and drug cartels, the president and his supporters have argued, while local Mexican officials in Tijuana, where thousands of those traveling with the caravan are currently staying, have criticized the migrants and the problems the caravan has caused in their local community. Trump and administration officials vehemently defended their agents’ use of tear gas and pepper spray in responding to the lawlessness and chaos at the border, which was hysterically criticized by Democrats and opponents of the president. “That has happened before and, if we are rocked, that would happen again tomorrow,” he explained to reporters recently. Trump also defended the response of the Border Patrol agents. U.S. Customs and Border Protection Commissioner Kevin McAleenan told reporters that hundreds of people attempted to rush the vehicle lanes at the border crossing that day, and the agents on duty used their professional judgment to handle the situation appropriately. Other administration officials, including Department of Homeland Security Secretary Kirstjen Nielsen, argued that many of the migrants attempted to use children as “human shields” in order to cross the border. Tijuana Mayor Juan Manuel Gastélum has been vocal in his criticism of the migrant caravan, as have countless local Tijuana residents who view the migrants as disrespectful, disruptive, and entitled. Gastélum said the migrants are “doing things outside the law,” and that the caravan was “maliciously organized” with the “goal of creating trouble,” according to the Epoch Times.